Playing with Papercrafting: You're the Apple of My Eye Thank You Cards! Here's another stamp set that took me a long time to warm up to. Apple of My Eye is cute, bold and works well with bright colours, but until I decided to mask the images so I could layer them, I wasn't really thrilled with the style. But since I love anything citrus, I gave them another try for some customer thank you cards. 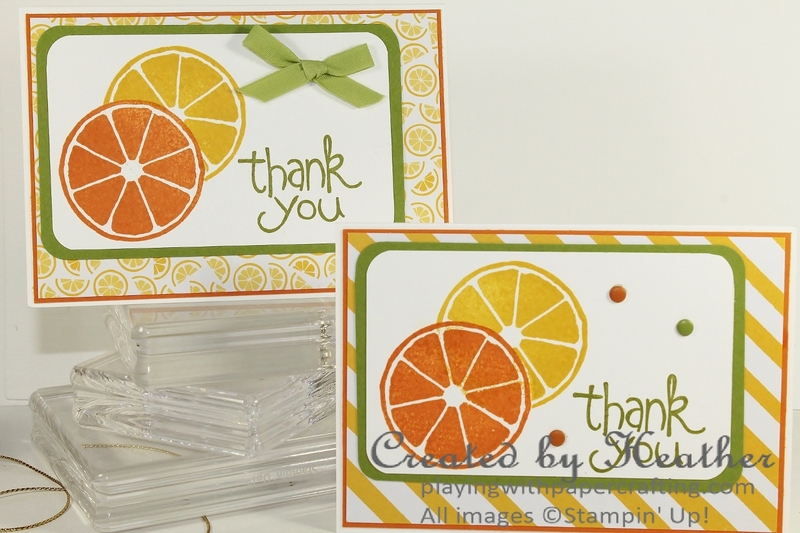 The stamp set has a great thank you sentiment and it's perfect for those citrusy oranges and yellows and greens. I used the Whisper White Note Cards and Envelopes and made up a whole batch of 20 cards, which are going like hotcakes these days. I backed them with a layer of Pumpkin Pie and then some Designer Series Paper, the lemon slices one from the Have a Cuppa and the stripes from the It's My Party Designer Series Paper Stack. I stamped a citrus slice on a Post It Note and punched it out with a 1 3/4" Circle punch and used it to cover the first orange slice while I stamped the lemon slice. Pull away the mask and it looks like the yellow is behind the orange. The sentiment was stamped in Old Olive and some Brights Candy Dots were added, or a small bow tied with Pear Pizzazz cotton ribbon. One day left before the weekend. What are your plans? Anybody planting their garden? See you tomorrow with another As You See It Design for the Challenge.